FFC 32: Graves vs. Seumanutafa"
Las Vegas, NV, (October 18, 2018) - The weights are official for "FFC 32 - Graves vs. Seumanutafa", an all-MMA event, which takes place Friday, Oct. 19 at the all-new Fight Dome Las Vegas, located at Rio Las Vegas. Doors open at Fight Dome Las Vegas for "FFC 32 - Graves vs. Seumanutafa" at 5:30 pm (PST), the first bout begins at 6:00 PM (PST) and the event will air on CBS Sports Network. Check your local listings for more information. 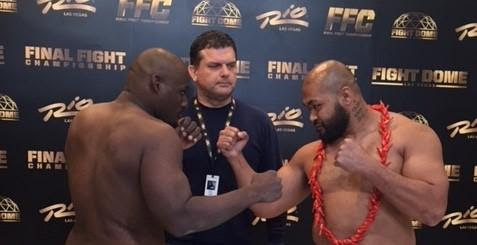 For more information on FFC you can visit www.finalfightchampionship.com or follow FFC on Instagram, Twitter and Facebook @FFCFighting. Adam "Smash" Smith (11-9-0), Spokane, WA 156 lbs. Brandon "Kiba" Ricetti (8-2-0), Chico, CA, 155 lbs. Edmilson "The Amazonian Warrior" Freitas (7-2-0), Manaus, Amazonas, Brazil, 169 lbs. Shelton "Gravedigger" Graves (8-3-0), Baltimore, MD, 259.2 lbs. Carl "Badwater" Seumanutafa (11-8-0), San Francisco, CA, 262 lbs.